The Global Volcanism Program has no activity reports for Table Top. The Global Volcanism Program has no Weekly Reports available for Table Top. The Global Volcanism Program has no Bulletin Reports available for Table Top. The Global Volcanism Program has no synonyms or subfeatures listed for Table Top. Table Top and Wide Bay cinder cones, at the NE tip of the triangular NW extension of Unalaska Island across the bay from the town of Dutch Harbor, blanket or fill late-Pleistocene topography. Both 792-m-high Table Top and the 640-m-high Wide Bay cones were considered to be Holocene in age, with the Wide Bay cone being among the youngest in a SW-NE-trending volcanic belt that passes through Makushin volcano (Miller et al., 1998), however, a later 40Ar/39Ar age of 68+/-14 ka was obtained from Table Top (AVO, 2005-). Table Top Mountain cone has an associated lava apron and was considered to represent a magmatic system separate from that of Makushin volcano and Wide Bay cone (Nye, pers. comm. 2008). Alaska Volcano Observatory, 2005-. Volcanoes. 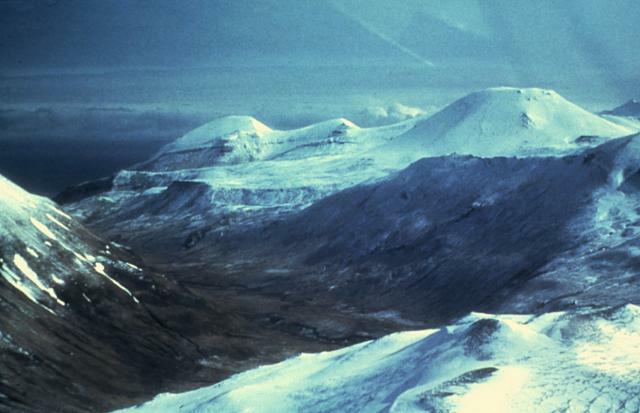 http://www.avo.alaska.edu/volcanoes.php. Drewes H, Fraser G D, Snyder G L, Barnett H F, 1961. Geology of Unalaska Island and adjacent insular shelf, Aleutian Islands, Alaska. U S Geol Surv Bull, 1028-S: 583-676. Nye C J, 2008. (pers. comm.). The Global Volcanism Program is not aware of any Holocene eruptions from Table Top. If this volcano has had large eruptions (VEI >= 4) prior to 10,000 years ago, information might be found on the Table Top page in the LaMEVE (Large Magnitude Explosive Volcanic Eruptions) database, a part of the Volcano Global Risk Identification and Analysis Project (VOGRIPA). There is no Deformation History data available for Table Top. There is no Emissions History data available for Table Top. The Global Volcanism Program has no photographs available for Table Top. There are no samples for Table Top in the Smithsonian's NMNH Department of Mineral Sciences Rock and Ore collection. Large Eruptions of Table Top Information about large Quaternary eruptions (VEI >= 4) is cataloged in the Large Magnitude Explosive Volcanic Eruptions (LaMEVE) database of the Volcano Global Risk Identification and Analysis Project (VOGRIPA).